Historically, impact investing has been associated with a much longer time period, lower liquidity, and potentially lower market returns. 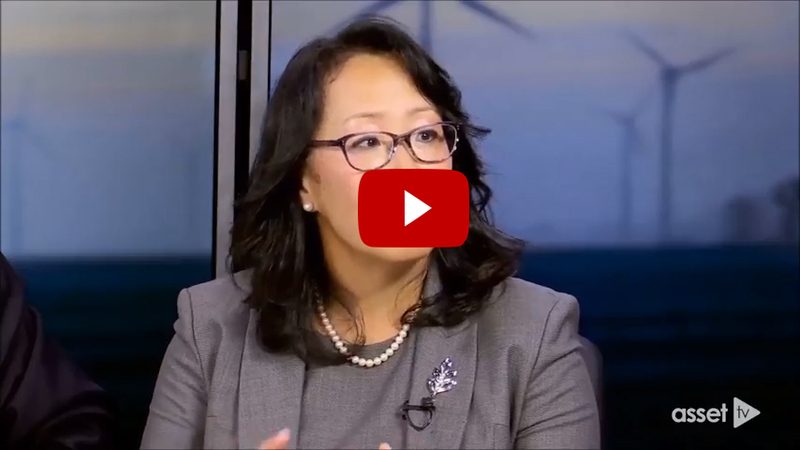 Mary Jane McQuillen, Portfolio Manager at ClearBridge Investments, recently participated in an AssetTV Master Class countering those outdated beliefs. This is a strategy that goes by many names – impact investing, socially responsible investing (“SRI”), environmental, social and governance (“ESG”) investing – the list goes on. While there has certainly been a lot of chatter about the confusion surrounding the ESG alphabet soup, one thing is certain – ESG ideals are being used across asset allocations without sacrificing performance. Panelists agreed when Ms. McQuillen asserted that the onus of responsible investing isn’t just on the client anymore. Managers are now taking an active role, outlining their process and approach to garnering sustainable returns, identifying sustainable practices, and making them a part of their overall investment approach. ClearBridge isn’t the only investment manager stating that performance isn’t sacrificed when applying ESG themes across strategies – many surveys and reputable academics have conducted research supporting this claim. Among the major institutions conducting studies about impact investing is the United Nations Principles for Responsible Investment (“UNPRI”). Ms. McQuillen discussed the UNPRI’s publication of “A Practical Guide to ESG Integration for Equity Investing.” This was released on September 8, 2016 at their annual PRI in Person conference in Singapore. It is touted as the largest report and survey of ESG integration techniques for public equities and includes over 10 company case studies of analysis in the report. 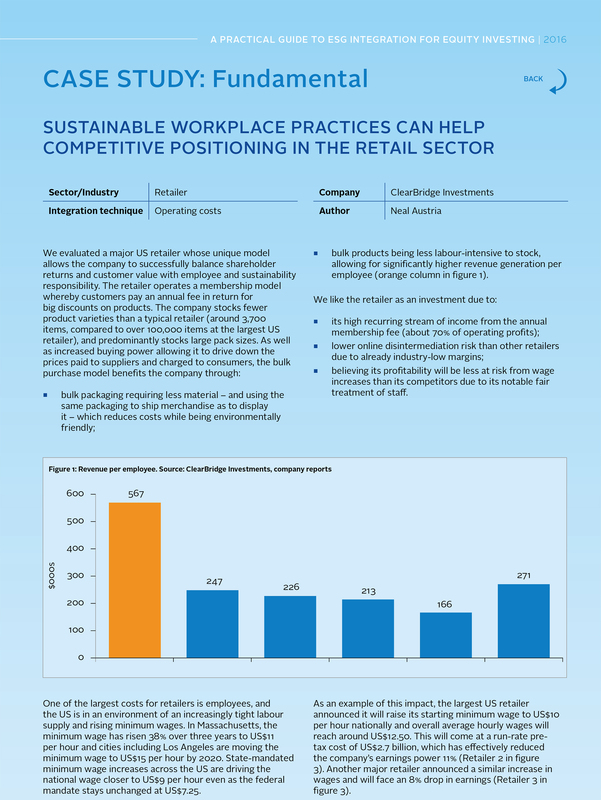 ClearBridge contributed a case study that discussed how sustainable workplace practices improved the competitive positioning of the one of the largest retailers in the U.S. 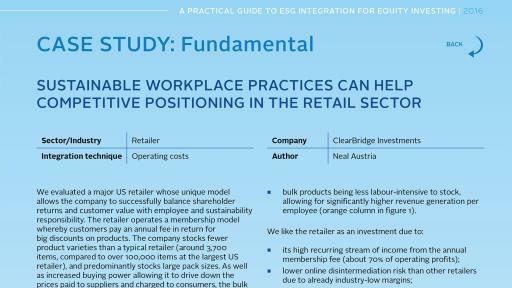 The study highlighted the retailer’s higher than average wages and employee productivity as core to its success. ClearBridge Investments is a well-established global investment manager with $105.4 billion in assets under management as of June 30, 2016. With a legacy dating back over 50 years, the firm’s long-tenured portfolio managers and fundamental research team focus on building equity portfolios for clients who seek income, high active share or low volatility solutions. Owned by Legg Mason, ClearBridge Investments operates with investment independence from headquarters in New York and offices in Baltimore, San Francisco and Wilmington. Legg Mason is a global asset management firm with $737 billion in assets under management as of August 31, 2016. The Company provides active asset management in many major investment centers throughout the world. Legg Mason is headquartered in Baltimore, Maryland, and its common stock is listed on the New York Stock Exchange (symbol: LM). All investments involve risk, including loss of principal. Past performance is no guarantee of future results. Equity securities are subject to price fluctuation and possible loss of principal.